President Trump's Cabinet nominees were on message in January when senators drilled them on climate change at their confirmation hearings. One after the other, they distanced themselves from Trump's idea that global warming is a hoax. They offered reassurances that their views comport, mostly, with mainstream scientists who say that humans are driving climate change. They just weren't sure how much. At the time, some Obama administration officials felt cautiously relieved. They knew Trump's staff would halt climate action, but they thought the heads of energy and environment agencies might at least stay out of a broader political and legal fight over whether climate change is real. "I was shocked when I watched [EPA Administrator Scott] Pruitt," said Tristan Brown, deputy associate administrator for congressional affairs at EPA under Obama. "There was a big concern going into his confirmation that he was going to try to undermine the endangerment finding," Brown said. "He let them believe that he thought climate change was settled and the question was what do you do about it." Over the following weeks, newly minted officials began expressing views on climate change that sharply diverged from the scientific mainstream's determination that human activity is largely driving global temperature increases. Some even seemed to question the role that carbon dioxide plays in the greenhouse effect, observed by scientists for more than a century. In defiance of decades of research to the contrary, Pruitt and Energy Secretary Rick Perry have both questioned humans' role in warming and whether climate science is "settled." Now both officials are preparing to mount formal challenges to climate change research through "red team, blue team" exercises. Many climate advocates see it as a bait and switch. "It certainly seemed like Pruitt was planning not to take on the endangerment finding and climate science based on what he was saying," said former EPA air chief Janet McCabe. Pruitt still hasn't said whether he will fight the endangerment finding — EPA's legal finding that carbon dioxide is dangerous to public health and must be regulated. But he is moving ahead with plans to debate human effects on climate change. The White House, during this period, has declined to explain the president's view about rising temperatures and if he accepts the scientific findings related to people's impacts on the climate(Climatewire, June 23). When Pruitt testified before senators early this year, he acknowledged man-made climate change but said human impacts couldn't be measured precisely and required more debate. He called his personal opinion on the matter "immaterial." The law dictates how EPA handles greenhouse gases, he said (Climatewire, Jan. 19). Other nominees, including those now running the Interior and State departments, hewed closely to that argument. 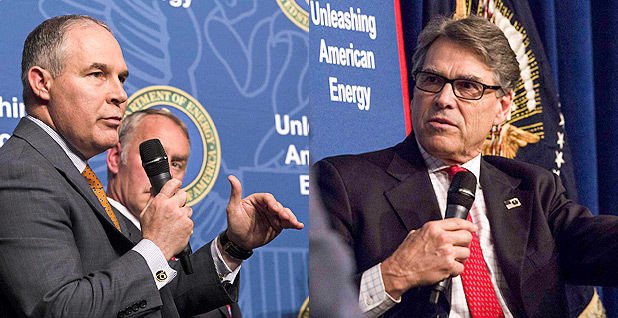 Perry said natural and man-made sources cause climate change (Climatewire, Jan. 20). During the confirmation process, Sherpas are assigned to work with nominees, to pore through their records and guide them against responding to questions about particular policies they might support. Senate confirmation hearings are like cross-examinations. Nominees talk about their background and answer questions while committing as little as possible to future action. Pruitt hadn't said much publicly about climate change as Oklahoma attorney general, aside from a jointly authored op-ed (Climatewire, Dec. 8, 2016). When he went before the Senate Environment and Public Works Committee, he neatly navigated around questions about climate change, staying largely in line with his previous comments. Perry, during his hearing, took a step back from his previous views that climate change is a "contrived, phony mess," saying some effects are naturally occuring and others are man-made (Climatewire, Jan. 20). Secretary of State Rex Tillerson said during his hearing that climate change is real, but the ability to predict the effects of greenhouse gases is "very limited." Interior Secretary Ryan Zinke told senators that he did not believe climate change was a hoax. Now, fast forward: Pruitt, Perry and Zinke have veered far from their confirmation comments since taking the helms at their agencies. Pruitt and Perry have both said they doubt whether carbon dioxide causes climate change, a finding that is foundational to studies of the greenhouse effect. During an interview on CNBC's "Squawk Box" in May, Pruitt stated that humans were not the "primary contributor" to climate change. Those comments mark a turning point for the administrator and how he talks about climate change, though he maintains that his statements have not changed since his confirmation hearing. A month later, in an appearance on the same CNBC program, Perry echoed Pruitt's statements. Humans are not to blame, he said. Instead, the "control knob" for climate change is "most likely" ocean waters and the environment, Perry asserted. Both men have also attacked the idea that climate science is "settled." Zinke, questioned last month by Sen. Al Franken (D-Minn.), punted on questions about climate science. He said scientists cannot "predict with certainty" how much warming will occur and said "there isn't a model that exists today that can predict today's weather given all the data." Gavin Schmidt, director of the NASA Goddard Institute for Space Studies, pointed out that even gravity and other widely accepted scientific concepts hold uncertainties, from a technical perspective. "But for practical purposes, the value is known precisely enough to be useful. Nothing is known with absolute certainty," Schmidt said. Climate science is similar, he added, in that uncertainties exist around specific details, like ocean surface temperatures. But overall warming trends are strongly supported by numerous data sets. So, practically speaking, the climate data are useful. One reason people perceive great uncertainty in climate science is because communication about global warming tends to focus on changing details, rather than the bigger picture of what the data are showing, he said. "The big picture is like an edifice, it's a skyscraper that was built on years of work. The things we are arguing about is the color scheme on the 14th floor," Schmidt said. Edward Maibach, director of the Center for Climate Change Communication at George Mason University, said the diverging comments from Cabinet members could sway people who recognize that climate change is happening but aren't committed to it as fact. He said Pruitt's program to question science is "a very clever communication tactic to reinforce what he wants Americans to believe, which is that the science isn't settled." Yale University's Program on Climate Change Communication found that most Americans, 58 percent, acknowledge man-made climate change. But they don't have strong "belief certainty," Maibach said. "Things like this can have a very powerful unsettling effect on people who are already uncertain to begin with," he said.